PARLIAMENT: Taking the lead in reducing plastic waste would be a good thing for the United Kingdom Houses of Parliament. Start as you mean to go on, or admit that you could not give a fig. Either way the public who are opposed to marine litter will be able to gauge what the political mood is. 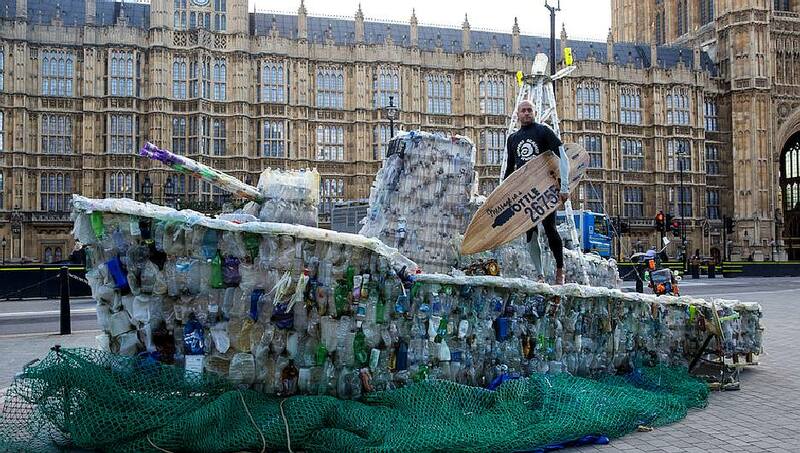 The picture is of Hugo Tagholm (Surfers Against Sewage) with a model ship made of plastic marine litter. Nice one Hugo. Surfers Against Sewage (SAS) is a marine conservation charity working with communities to protect oceans, waves, beaches and marine life. It was created in 1990 by a group of Cornish surfers from the villages of St Agnes and Porthtowan on the north coast of Cornwall. Set up as a single-issue campaign group in 1990, Surfers Against Sewage led a nationwide campaign for improved water quality. Their campaign's success was helped by the privatization of English water companies in the late 1980s and key pieces of EU legislation including the Bathing Water Directive. In 2012, Surfers Against Sewage was recognised as a national marine conservation charity focused on the protection of waves, oceans, beaches, marine wildlife and coastal communities. Today the organisation represents an ever-expanding supporter base and campaigns on a diverse range of issues. SAS campaigns for both the UK’s coastal environment and the health of all surfers and other recreational waters users. Recently, SAS has expanded its remit into the protection of the wave resource and surfing spots through the Protect Our Waves (POW) campaign. Since 1990, SAS has secured a multitude of campaign successes on behalf of all water users. More recently, Surfers Against Sewage have turned their attention to battling the new sewage - plastic pollution. Through national initiatives such as the Big Spring Beach Clean and the Autumn Beach Clean Series they hope to empower communities to protect their coastlines. 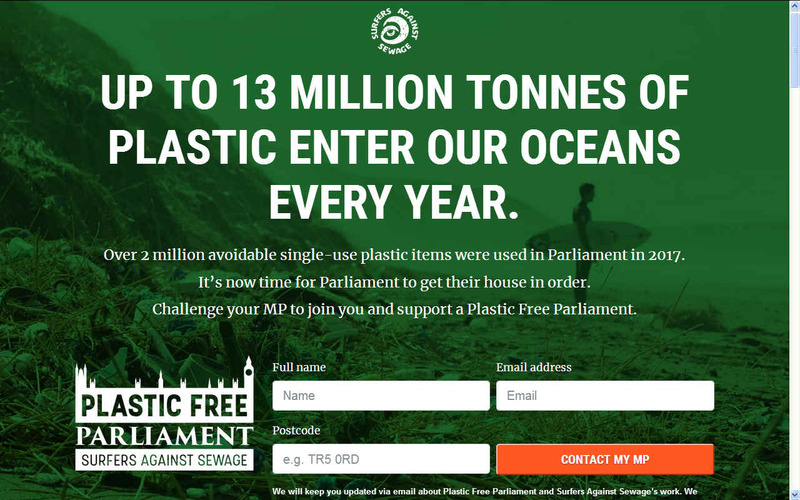 Further up in the chain of events, SAS are using their Waves All-Party Parliamentary Group (APPG) to encourage politicians to explore and introduce policies to prevent plastic emissions from entering the environment. SAS launched the Protect Our Waves campaign to increase public awareness to the importance of waves in the socioeconomic fabric of many UK coastal communities. Behind the scenes SAS has been consistently representing surfers and waveriders on rights of access, and ensuring the wave resource is recognised and valued. Campaigners are demanding that the UK parliament cuts its use of throwaway plastics, as new figures show the Westminster estate purchased more than 2m plastic straws, bottled drinks, plastic-lined coffee cups, food sachets and cutlery items last year. Freedom of information requests submitted by Surfers Against Sewage show that hundreds of thousands of items of plastic cutlery, more than a million takeaway coffee cups and nearly 22,000 plastic straws were used last year in the Commons and Lords. The figures were revealed as the Prince of Wales was set to give a speech describing the scale of plastic pollution of the ocean as a “nightmare” which was “set to get worse rather than better”. The prince will call for local, national and global action to stop the flow of plastic into the seas. He will call on leading business figures, supermarkets, raw materials manufacturers, drinks companies and policymakers to cooperate to make their plastics more recyclable, reduce plastic production and recover as much plastic as possible from the world’s oceans. 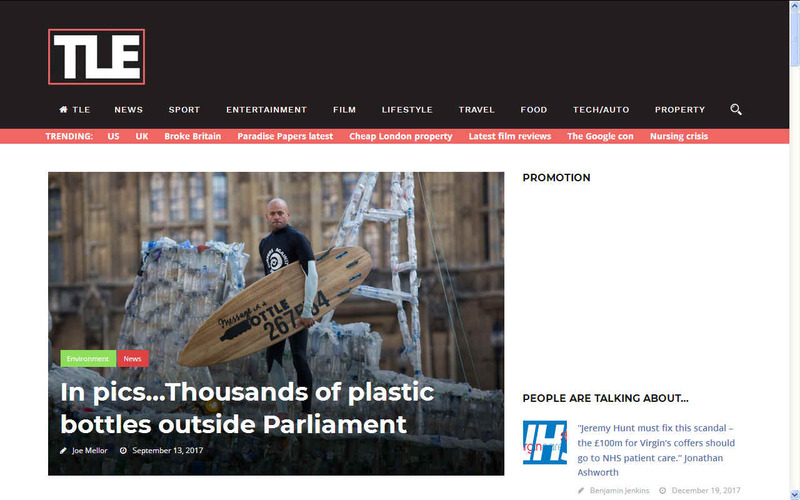 Launching their campaign to make the UK parliament plastic-free Surfers Against Sewage called on individuals to lobby their MPs to reduce the throwaway plastic footprint of the House of Commons and House of Lords. Hugo Tagholm, of Surfers Against Sewage, said parliament had taken some steps to reduce throwaway plastic, but more could be done. He called for MPs to make personal pledges to stop using plastic water bottles and to use refillables instead. He is calling on parliament to increase water fountains throughout the buildings. This month the prime minister focused attention on reducing the use of throwaway plastic as she launched a 25-year environmental plan. Tagholm has written to the Speaker of the Commons to ask if parliament can lead by example and take ambitious action to tackle the global problem. 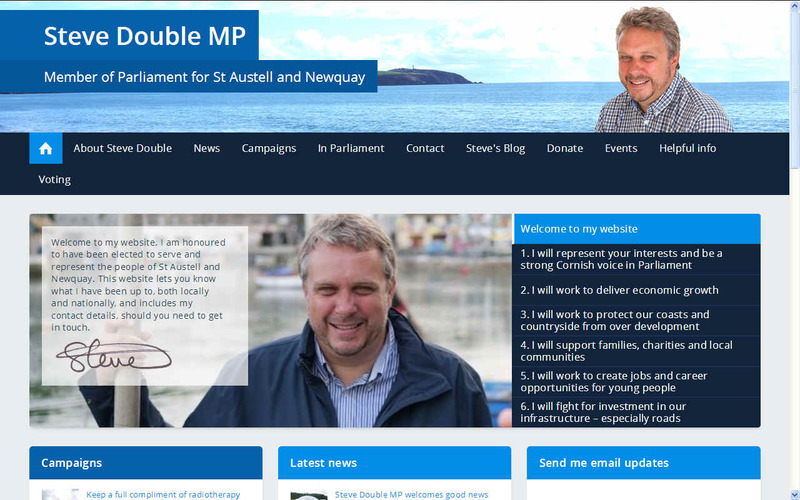 Steve Double, the Conservative MP for St Austell and Newquay, said the coastlines of his constituency were all under threat by the marine menace of waste plastic. “MPs ... have our own role to play in raising awareness and setting an example on this important matter,” he said. 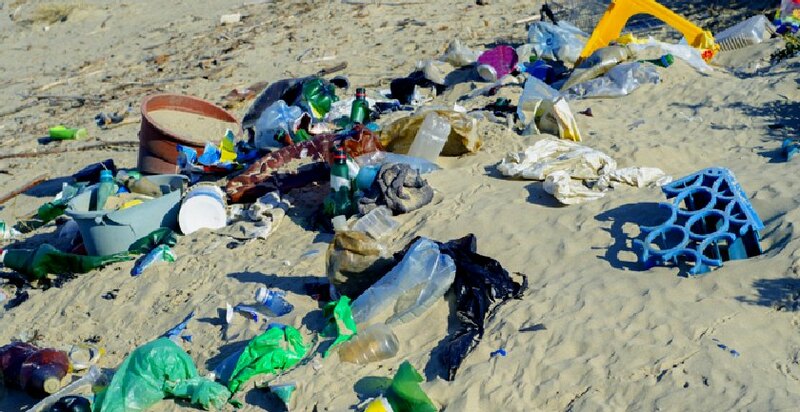 At least 8m tonnes of plastic leak into the oceans each year and are now reaching into the furthest depths of the seas. 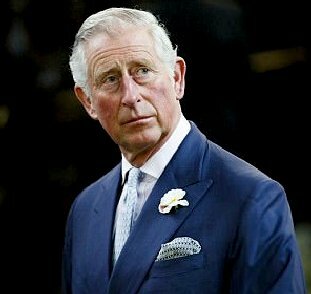 PRINCE CHARLES: Has long been a supporter of the cleaner oceans cause, speaking at various events about the problem. 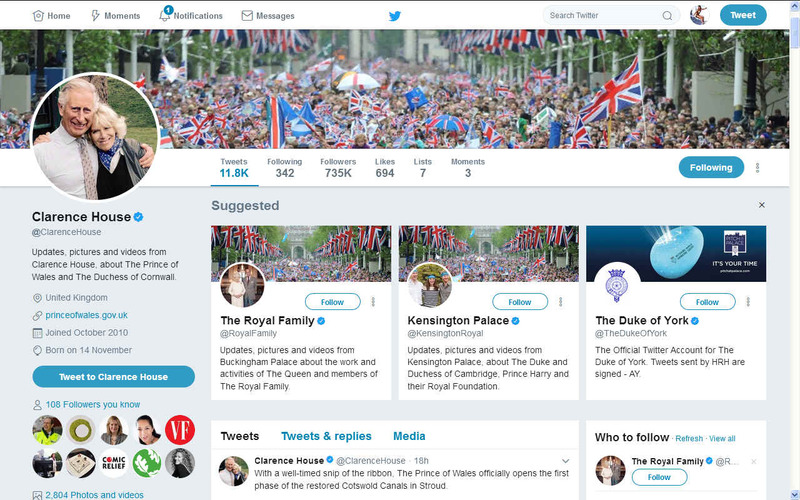 HRH was in the Royal Navy of course and there is a strong Naval tradition in the United Kingdom, despite the fact that war as a concept is fading fast in the new world of global communications, drones and robotics. These are all great initiatives and along with this, public awareness of the plastic waste problem has never been higher. There are plenty of grass-roots movements starting to look at how we as communities can address the problem. Several originate in Cornwall, including the Refill initiative, which sees businesses providing free water to encourage less use of single use plastic bottles, the Final Straw group, which looks at eliminating plastic straws from our hospitality sector, and the Plastic Free town movement, which recently saw Penzance pledge to become the first plastic free town in the country. Members of Parliament, as community leaders, have our own role to play in raising awareness, taking a lead and setting an example on this important matter. 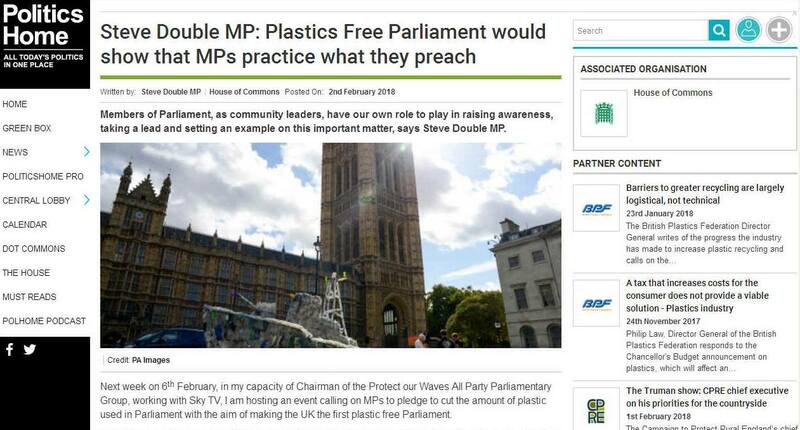 That is why I am pleased to be working with Sky and Surfers Against Sewage to bring forward the Plastic Free Parliament Campaign. Specifically, this campaign is all about getting MPs to practise what many of us preach and sign up to reduce the amount of plastic we use in our offices. I am looking forward to the event and hope this will be another step the fight against plastic waste. 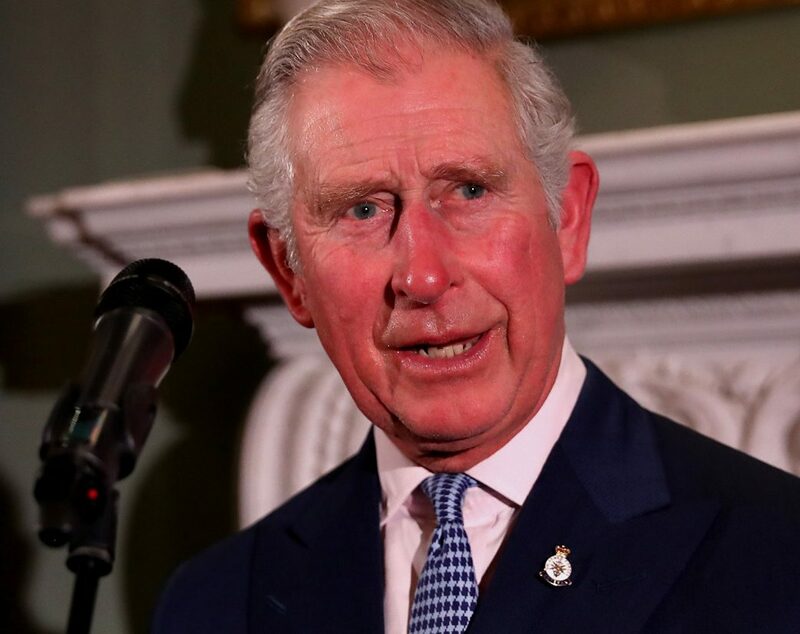 PRINCE CHARLES: Conservationist Royal, the Prince of Wales has long been outspoken on environmental issues, sometime taking a lot of flak for his efforts. Well done on that your Highness. More than 1 million disposable coffee cups were purchased in Parliament last year, latest figures reveal, as campaigners urge politicians to ditch single-use plastic. Despite Theresa May launching her 25-year plan in a bid to eradicate all avoidable plastic waste in the UK by 2042, large quantities of disposable plastic are still being purchased in Parliament. Plastic straws, coffee cups, condiment sachets, plastic cutlery and disposable plastic water bottles are among the items still widely-used. In total, more than 2 million avoidable single-use plastic items were purchased by the House of Commons and the House of Lords in 2017. Plastic cutlery was the second most-purchased item after coffee cups, with a total of 398,000 being bought in Parliament. Soft drink bottles accounted for 200,584 of the single-use plastic items purchased, with 193,050 coming from the House of Commons. Environmental campaigners have urged the prime minister to lead by example in the war on plastic. Surfers Against Sewage (SAS), who obtained the figures through a Freedom of Information request, said that an immediate latte levy on disposable plastics could help reduce the number of products used. SAS also urged MPs to bring in their own reusable cup to combat waste and have launched the Plastic Free Parliament campaign. 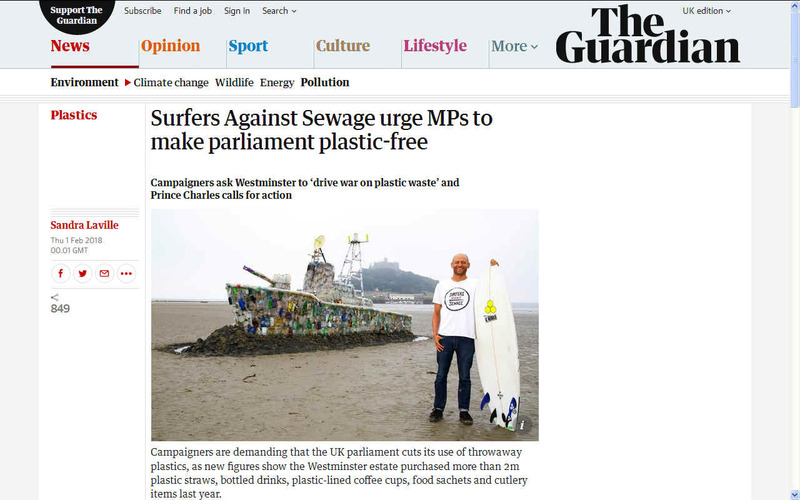 Hugo Tagholm, CEO of Surfers Against Sewage said: “The engine to drive the war on plastic waste is in the Palace of Westminster where our elected politicians can pass progressive new legislation to decouple society from its addiction to avoidable, single-use plastics. “They must also set an example in refusing avoidable plastics, and send a strong message to the world from a Plastic Free Parliament. 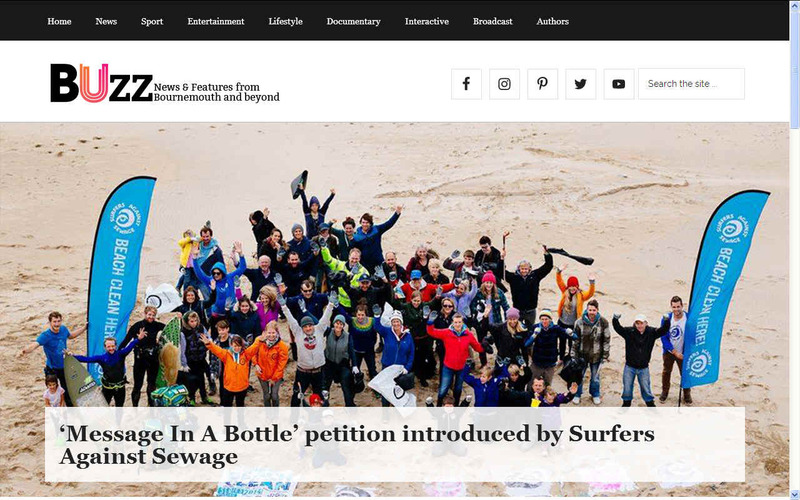 Surfers Against Sewage has written to the speaker of the House of Commons to request that Parliament takes urgent action on plastic. Conservative MP Steve Double said: “There are many steps we can take as consumers to reduce the amount of single use disposable plastics we use. “Members of Parliament, as community and national leaders, have our own role to play in raising awareness and setting an example on this important matter. 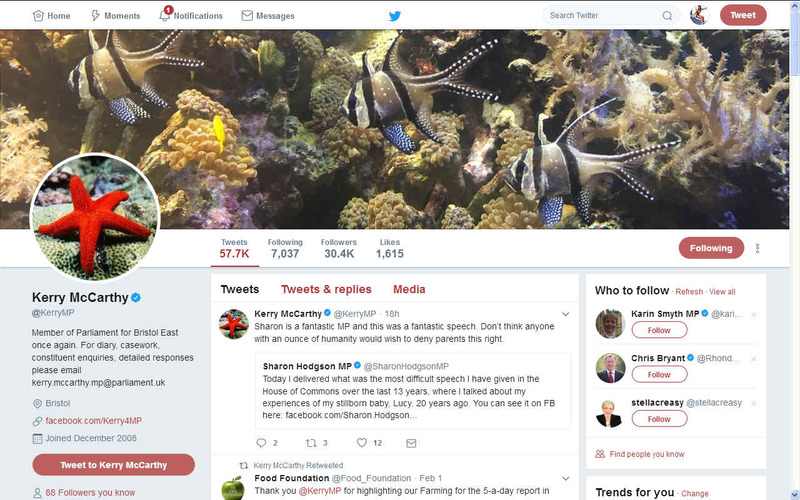 Labour MP Kerry McCarthy added: “The recent series of Blue Planet II has brought to public attention the serious damage plastic is causing to our marine life and habitats. “Pressure is rightly growing on all of us to take action to reduce our plastic footprint. “It is time for Parliament to not only get its own house in order, but take a lead on ambitious action to end its use of throwaway plastic”. This website is provided on a free basis as a public information service. copyright © Cleaner Oceans Foundation Ltd (COFL) (Company No: 4674774) February 2018. Solar Studios, BN271RF, United Kingdom. COFL is a charity without share capital.